“Surrender! You will be converted.” The Cybermen are on the march through the Hundred Realms of the Land of Fiction, killing and converting their victims as they go - fantastical victims including fairies, giants, valkyries and superheroes. Resistance is useless. Trapped on the outermost fringes of the battle, the Sixth Doctor and Jamie McCrimmon are astonished to encounter an old friend: astrophysicist Zoe Heriot. It’s the happiest of reunions. However, what hope is there for a happy ending against the unstoppable might of the Cybermen...? I listened to most of this audio drama on the day that The Big Bang, the final episode of Matt Smith’s first season, was broadcast. It’s interesting to compare and contrast the two stories. Both deal with the relationship between imagination and reality, but from opposite directions, as it were. Whereas Legend of the Cybermen and The Mind Robber (the story to which this is a sequel) deal with “real” people entering a fictional realm and being threatened with the prospect of being turned into fiction, the two-parter The Pandorica Opens / The Big Bang sees characters and objects from fiction and from Amy Pond’s imagination and memories being brought to life. In common with The Pandorica Opens / The Big Bang, this double CD also brings back numerous crowd-pleasing elements from the show’s past. 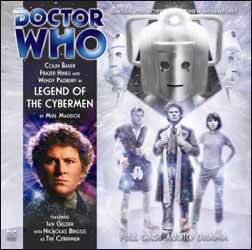 In the case of Legend of the Cybermen, the crowd-pleasing elements in question are the Land of Fiction, Zoe (Wendy Padbury, joining Frazer Hines in a Doctor Who story for the first time since The Five Doctors) and the Cybermen (Nicholas Briggs). Authentic sound effects for the white void, clockwork soldiers and control area from The Mind Robber add to the atmosphere and generate a genuine nostalgic thrill - unless of course you’ve never seen that serial, in which case you’ll probably be rather mystified. Wendy Padbury slips back into her role, interacting with Hines as though they’d never been apart and with Colin Baker’s Time Lord as though he really is the same man as Patrick Troughton’s Second Doctor. However, the change in Padbury’s voice since 1969 is noticeable, which makes me wonder why the production team insisted that she play a version of the character that hasn’t aged since The War Games. Curiously, the Cybermen sound more like the Tenth Planet versions than the Wheel in Space or Invasion models, but at least the Cyber-Planner (also Briggs) sounds as expected. The Cybermen’s new abilities, obtained by converting magical fictional beings, are exciting prospects. Their traditional-style revelation at the end of Part One is hardly a surprise, though, since their presence is revealed quite clearly on the CD’s cover and, of course, in the story’s title. Mike Maddox’s story isn’t just a field day for Who fans, however. His rich narrative is also populated by a veritable league of extraordinary characters from numerous other popular fictions, including older versions of Charles Dickens’s Artful Dodger (Steven Kynman) and Lewis Carroll’s Alice (Abigail Hollick), Bram Stoker’s Count Dracula (Ian Gelder), Jules Verne’s Captain Nemo (Alexander Siddig, reprising his role from The Wreck of the Titan) and Robert Louis Stevenson’s Long John Silver (Gelder again). Many of these characters, such as Alice and Dodger, have been forced to grow beyond the confines of their original narrative frameworks, though Dracula struggles against reverting to type. Like The Big Bang, Legend of the Cybermen cheerfully breaks many of the traditional rules of storytelling. Maddox points through or totally demolishes the fourth wall on several occasions, most obviously when Jamie finds himself in a recording booth performing an audio adventure for director Nicholas Briggs (as himself). Though amusing, this incident is probably the weakest of the in-jokes, having already been done to death in Big Finish’s Sapphire & Steel series. More subtle witticisms include the Doctor’s statement that “Whoever runs this place, they remember other people’s creations. Never allowed to invent their own characters, they merely come up with new adventures for existing ones”, which is a less charitable description of what Big Finish does, and Zoe describing the Doctor’s adventures as “targeted at children, but loved by adults”, which is a reference to Doctor Who itself. Despite the nostalgic flavour of this tale, the writer isn’t afraid to trample over the back stories of some of our most beloved characters. I was gutted to discover that the Jamie featured in this current trilogy of adventures is not the genuine article; that Zoe has spent most of the intervening years battling the Cybermen in the Land of Fiction; and that Leo Ryan, Tanya Lernov and the rest of the Wheel crew have either been killed or Cyber-converted. The concluding monologues are truly moving. Still, it’s good that fictional characters can inspire such passion - which is surely the point of the story. The first disc also includes nine minutes of Jamie Robertson’s music, while the second disc concludes with a similar helping of interviews with the cast and crew.